Why did I read this book: This was completely under my radar until folks I follow (and trust) on Twitter started to talk it up. I think it was Liz Bourke who eventually convinced me to read it. I will quickly preface this review by saying: wow. (I don’t think I can do this book justice). The Girls at the Kingfisher Club blew my mind away for its combination of deft storytelling, strong voice, beautiful story. And because of its characters. Oh my heart, these sisters. By 1927 all twelve of them were out dancing all night (but not every night). They never gave names or any information about themselves – most people just called each girl “Princess”. They loved to dance, to laugh, to dress up. Some liked to smoke, others to drink. Most of them liked to dance with men, at least one of them preferred girls. If you asked the men they danced with, they’d say the Princesses were mysterious and alluring. Most could not even keep up with their numbers (two pairs of twins in the twelve can certainly be confusing, isn’t it?). They made sure to keep away from the oldest one (no need to face that coldness when they could be greeted with the warmth of the youngest ones). They know nothing, these men. And it doesn’t matter anyway. 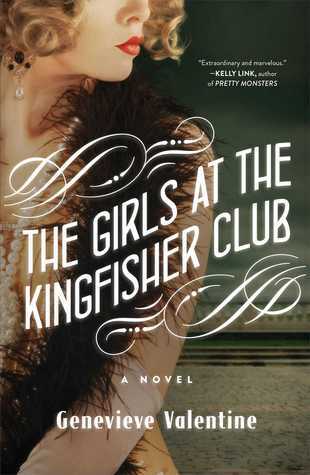 As you can probably tell by now, The Girls at the Kingfisher Club is a retelling of The Twelve Dancing Princesses (in the Jazz era) but this story is not about the men who danced with them. Nor it is a story about the men who will attempt to marry the girls. It is not a story about their abusive father. It is not even a story about the mystery surrounding their dancing. It’s a story about women. Sisterhood. Love. Hope. Romance. Freedom. Agency. Even though there are secrets that need to be kept, there is really no huge mystery about the girls and what they do almost every night. They survive. They thrive. They yearn: for freedom, for life, for anything they can get, for more. Above all, they defy. They are the twelve Hamilton sisters, the daughters of a powerful, rich, old (and dangerous) man. Jo (“The General”) is the oldest and she is still remembers her mother (most of the others barely knew their mother). She remembers when most of the other rooms upstairs were empty (not hers, her room has been shared with Lou ever since she can remember). Until they started to fill with girls who were born one after the other (after the other) in the hopes that one of them would be a man. There was never a boy though and their father just left them all the way up there – not exactly locked up but not free either. They don’t really know what happened to their mother. No one outside the house knows there are 12 daughters – their father’s shame and disgrace will not be shared with the world. So the girls spend their days up in the attic rooms together, reading, talking, dreaming. They have no idea what the future holds for them. Some of the girls have never been out in the daylight. But some nights? Some nights they manage to secretly get away and dance all evening, holding their breath hoping that they won’t get caught, holding their shoes in their hands not to make any noise (but surely someone must know). Jo was the first one – the one who taught them all to dance, the one who keeps them all together (is Jo like their father, she asks herself continuously. My hearts breaks every time she does so). Teaching them to dance was life-saving, dancing is life-affirming. But then their father decides they must marry (does he suspect?). Suitable men, chosen by him (how is a man who agrees to marry a girl kept confined in a house, “suitable”). One by one, the sisters will be married-off, separated. The thought is almost unthinkable to Jo (maybe she can save at least one of them. Maybe she can persuade their father that the youngest – Violet – can not marry yet. Surely she can see at least Lou off with someone who will keep her safe). I love the narrative – the storytelling and the voice. It reads very much like a fairytale, with a strong sense of detachment in places. This works really well to frame the story and make it convincing given the premise. But certain narrative choices in the storytelling counterbalance that detachment: the addition of (hidden, secret, inner) thoughts between parentheses (much like what I have been trying to emulate here) and flashbacks which enrich the story in such an assured way. The tale is generally from Jo’s viewpoint but interspersed with a few lines here and there from the other sisters’ pov. Jo’s voice though. Oh my goodness, Jo. It killed me. It really did. What she said, what she didn’t say. Her own secrets, her love for her sister Lou (Jo and Lou forever) and her falling in love with Tom (I love how there are no princes in this narrative although there are a few good men). Her inner life so carefully constructed by the author, so rich and complex. Jo’s viewpoint though is almost restricted, as restricted as their lives are. She is constantly worried, she is angry, she needs to keep her girls safe (she wants to get out. To run away. Oh, if only she could). Because of that, she barely even really know some of her sisters (their internal lives are after all, a secret to her too). But in the snippets from the sisters’ viewpoint, we see so much more, we see a whole universe, unexplored. The last quarter of the book is one of the strongest, most powerful endings I have read in a while. It starts with an order from The General (“Beat it!”) after which all hell breaks loose. It destroys everything (almost destroyed my heart it was beating so fast with worry) only to have lives built back on even stronger foundations of agency and independence. Actually one of things that struck me the most is indeed the topic of independence: it would have been easy to fall back into a framing in which all sisters are the same, sound the same, behave the same and end up the same. Considering this is a short novel – 277 pages – the fact that all 12 characters come to life the way they do (Jo, Lou, Doris, Ella, Araminta, Rebecca, Hattie, Mattie, Louise, Lilly, Rose and Violet) is almost a miracle of storytelling prowess. Genevieve Valentine, I hope you have a long, fruitful career writing more characters like these. Please and thank you. Rating:9 Damn Near Perfect; and a strong contender for a top 10 spot. WOW! This one sounds incredible! Not the type of book I’d usually pick up, but judging from your review I just may have to. This sounds fantastic! I LOVE the Jazz era setting, and I really, really love that it focuses on the princesses and gives them agency. I also REALLY enjoyed reading this book. I agree that there was just something about the way the story was told and unfolded that made it really feel like a fairytale. I wasn’t super familiar with the 12 Princesses fairytale when I read this book, but it made me want to read other retellings of it. Finally someone who shares my utter gushing love for Genevieve Valentine’s writing. She is really good at tugging at her readers’ heartstrings with just a sentence here or there. The impact the little snippets inside parentheses have, is astounding. As much as I loved The Girls at the Kingfisher Club, it didn’t reach the heights of Mechanique for me. I’m still stunned that book didn’t win all the awards. If you haven’t read it yet, go pick it up. The characters are even stronger in Mechanique and there are some strange, beautiful, destructive relationships in that story. My heart bleeds just thinking about it.